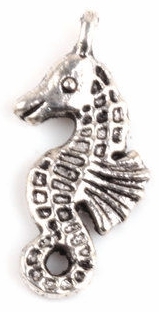 This Cameo-Like Silver Charm is perfect for charm bracelets, necklaces and of course, Artist Trading Cards. This charm is 1 1/4 in. long and 5/8 in. across. Attach it to your artwork with glue, a fancy piece of fiber, waxed linen, twine, ribbon etc. It is a one sided 3-D charm, but the back has the same facial indentation as the front of the charm. It looks almost like a mold on the back that you could also use, but I haven't tried that yet. Have fun with this one!